PYONGYANG, Nov. 3 (Yonhap) — Taekwondo demonstration teams from the two Koreas staged a joint performance in Pyongyang, showing moments of peace and unification on Friday. 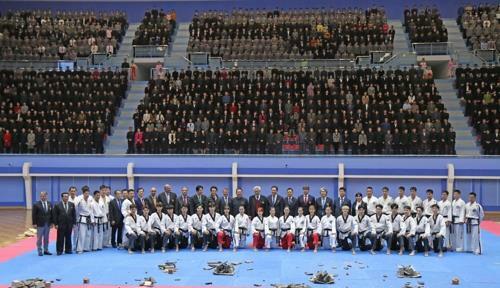 World Taekwondo (WT)’s all-South Korean taekwondo demonstration team and North Korean taekwondo practitioners from the International Taekwondo Federation (ITF) performed together in front of some 2,300 people who packed Taekwondo Hall in Pyongyang. This was the first time since April that the Seoul-based WT taekwondo demonstration team took the same stage with ITF performers in the North Korean capital. The WT taekwondo demonstration team had its own 60-minute performance at Taekwondo Hall on Wednesday, but didn’t perform with the ITF team. Friday’s performance was attended by WT President Choue Chung-won, International Taekwondo Federation (ITF) President Ri Yong-son and Choe Hwi, chairman of the North’s National Sports Guidance Committee. The WT and ITF teams first took the stage for 25 minutes each before they had a five-minute joint performance. The theme of the WT’s solo performance was “Again Magnolia,” which signified joy and sorrow throughout taekwondo’s history and its life force that overcame hard times. The WT’s 18 taekwondo practitioners used various props, from folding fans to flags. With “Ave Maria” playing as background music, they also delivered a performance that depicted the moment at the inter-Korean summit in April when North Korean leader Kim Jong-un and South Korean President Moon Jae-in crossed the line at the border village of Panmunjom holding hands. Following the WT team’s performance, ITF taekwondo practitioners delivered a performance that emphasized power and energetic movements, drawing avid support from North Korean fans. Then, the taekwondo performers from the two sides appeared on the stage. Although they had only five-minutes of joint action, they inspired a standing ovation from the crowd. In the joint performance, WT performers focused on showing kick techniques, while ITF taekwondo practitioners mostly showed punching moves. “I was moved when Pyongyang citizens gave us big applaud when we performed under music ‘Ave Maria’ and showed our desire for unification,” said WT taekwondo demonstration team member Jang Jong-pil after the performance. Following their joint performance at Taekwondo Hall, the WT and the ITF demonstration teams moved to Okryugwan, a famous restaurant in Pyongyang, for a dinner hosted by Choi. The 49-member WT delegation, including the demonstration team, will return home on Saturday. The delegation arrived in Pyongyang on Tuesday following an invitation from the ITF. Aside from the performance and talks, the delegation also had time to look around the city during the five-day visit. On Thursday, the delegation had a trip to the Pyongyang Central Zoo and a nature museum. Choue and other WT executives also visited Mangyongdae Children’s Palace, a public facility where North Korean students engage in extra-curricular activities, such as music and sports.